According to Eugène Heer’s book Der Neue Støckel Peter Oberhammer was born in Bruneck (Brunico), Trento in 1838. In 1856 he began serving an Apprenticeship in Innichen (San Candido), Trento. 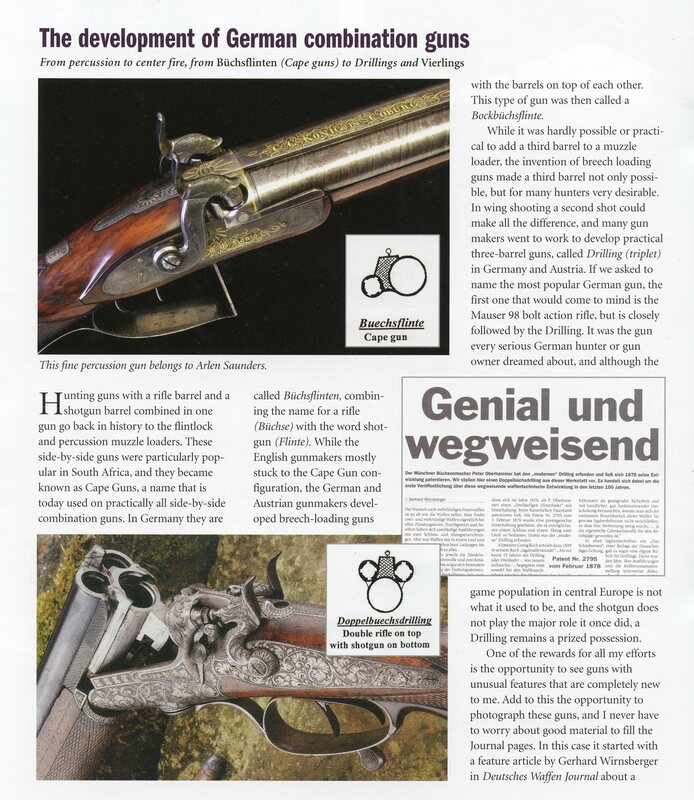 Starting in 1858 he was in Innsbruck, then Salzberg and on to Wien, Austria where he worked and nurtured his gun craft. By 1862 he was working for Franz Xaver Baader in München/Munich. In 1873 he started his own business in Munich. 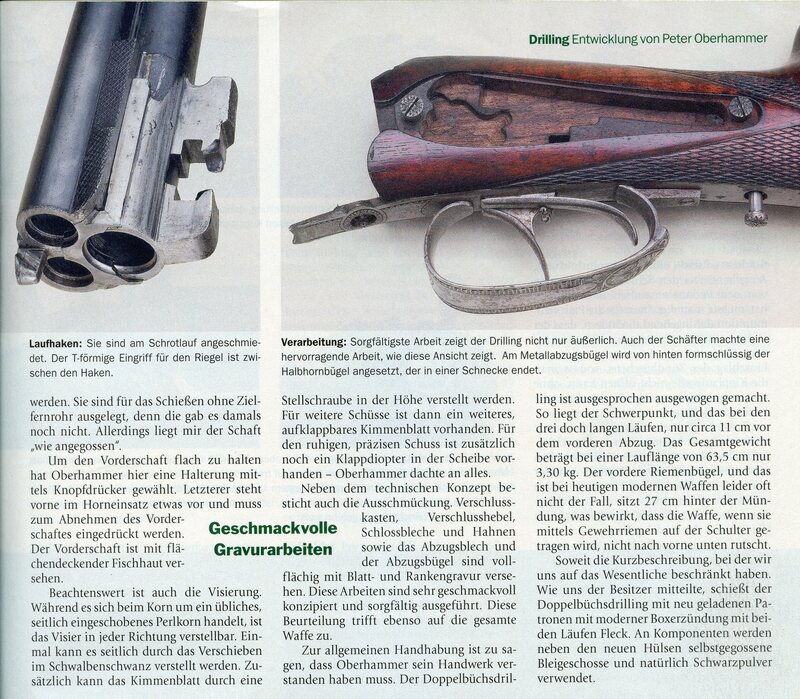 Gerhard Wirnsberg in his article Genial und Wegweisend from the Deutsches Waffen Journal states that Peter worked for Miller & V. Greiss in 1885. ( If Peter was in business for himself by 1873 then his association with Miller & V. Greiss was probably not as a direct employee but as a business associate or sub-contractor, the truth is we just don’t know). 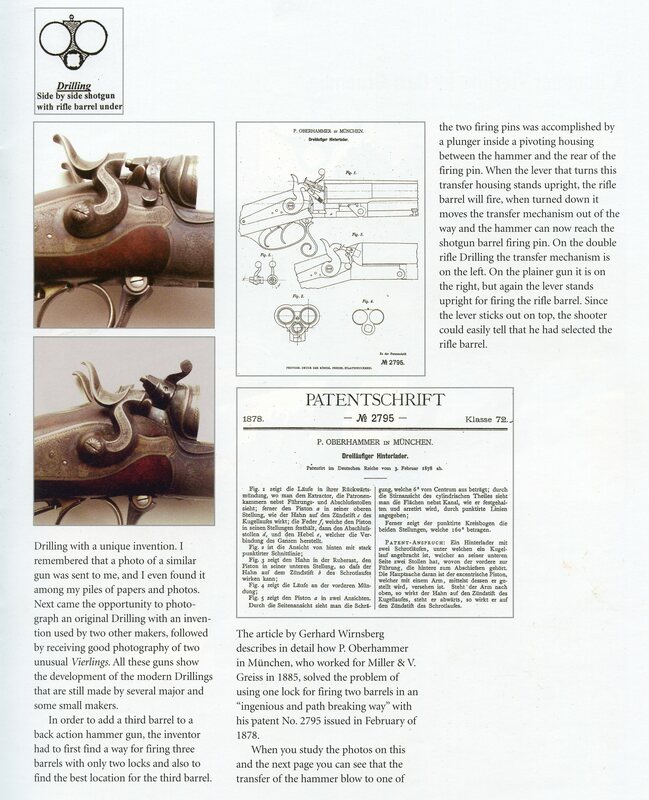 Peter’s son Ludwig was born in 1875 and learned the trade at the Stiegle shop in Munich. 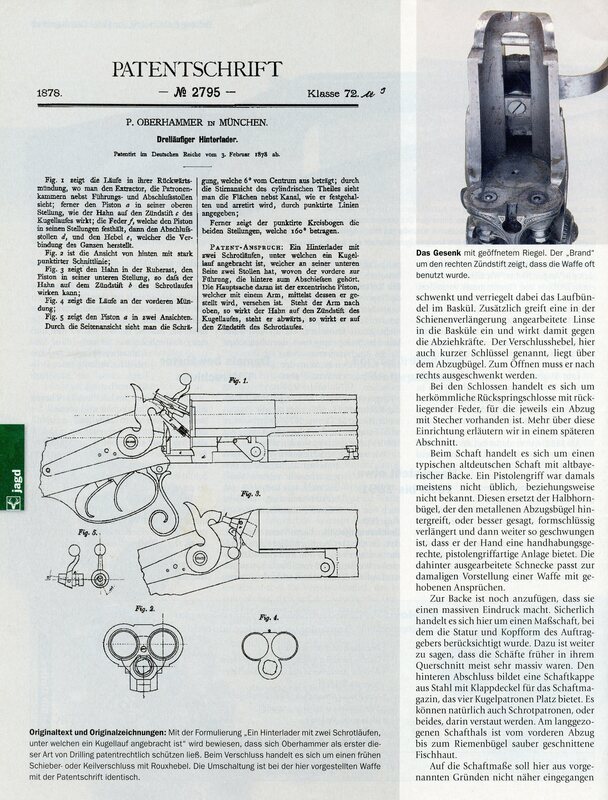 Ludwig would carry on in the gun making business and passed away in 1963. 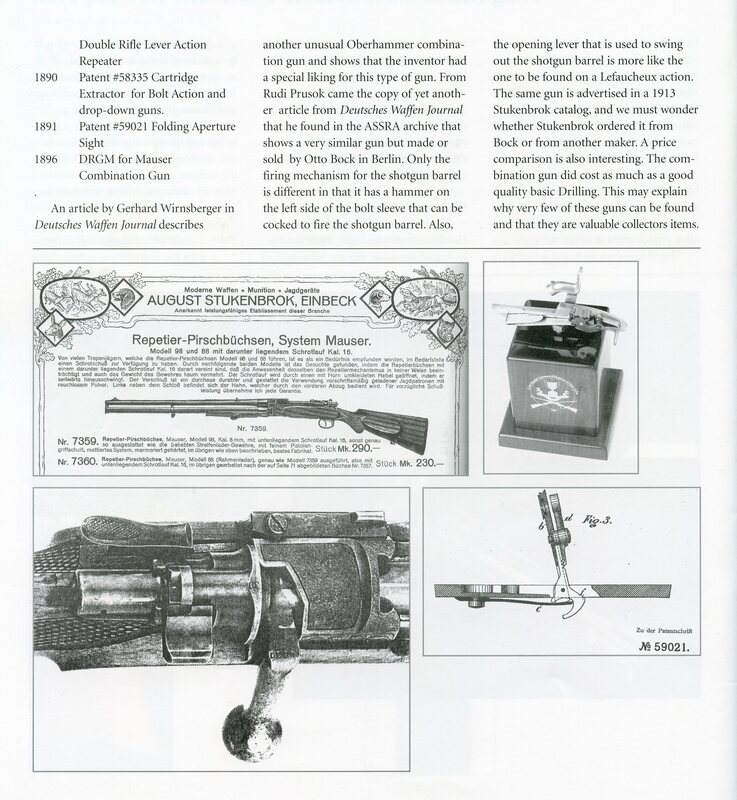 Peter’s first patent DRP no. 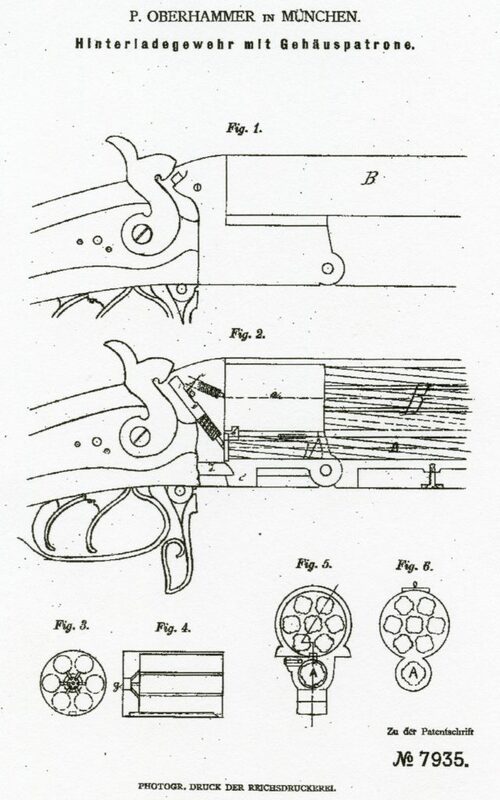 2795 was issued on Feb. 3, 1878 for a system that allowed one lock to selectively fire two differant barrels. This patent was followed by DRP no. 7935 issued on Dec. 18, 1879. 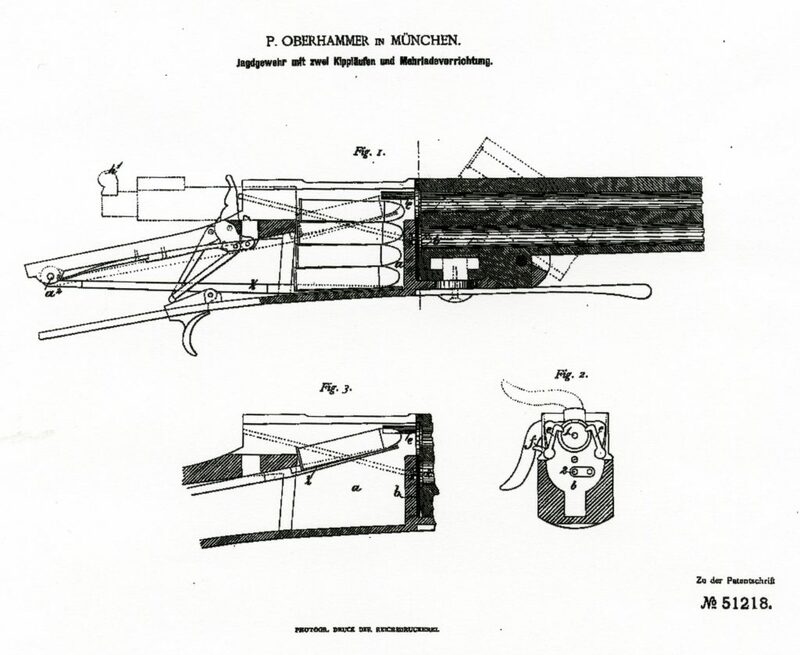 This covered a break action gun with over-under barrels the lower being a single barrel for a cartridge while the upper was a group of barrels with a removable breech cylinder that held multiple chambers that were ignited by one primer or percussion cap. 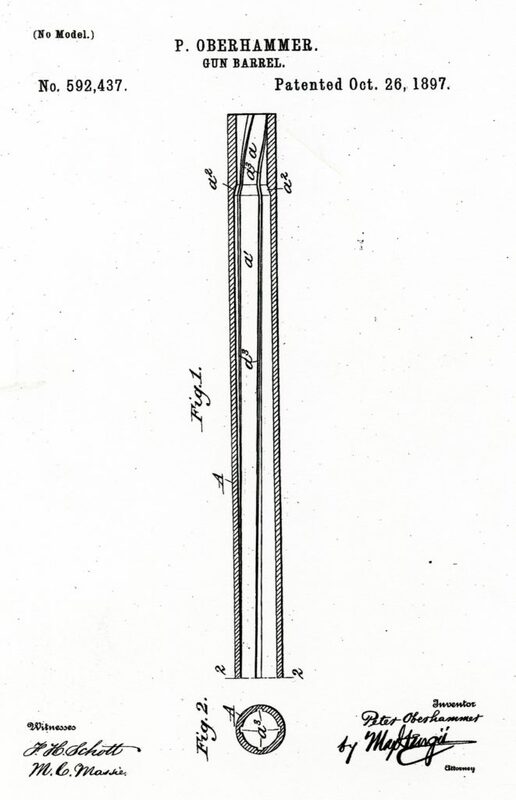 Patent (DRP) no. 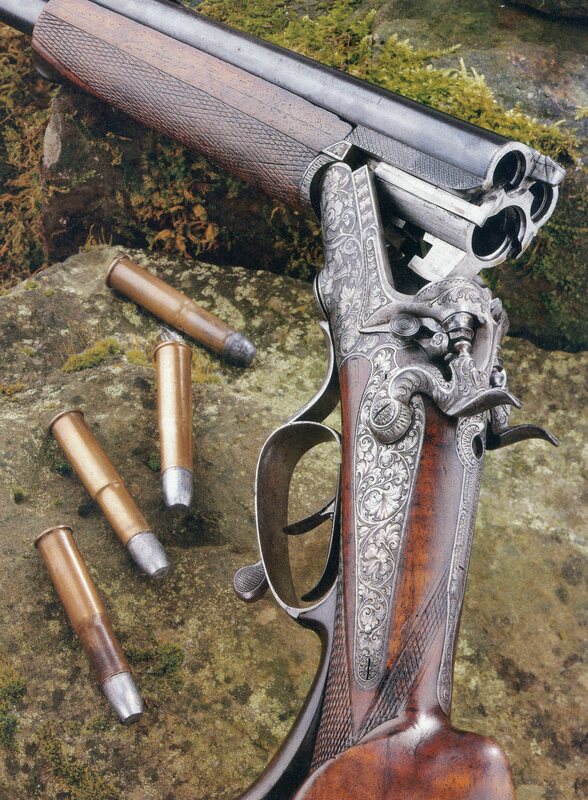 51218 was issued on March 14, 1890 for a Break action over-under with the upper barrel incorporating a repeating lever action. 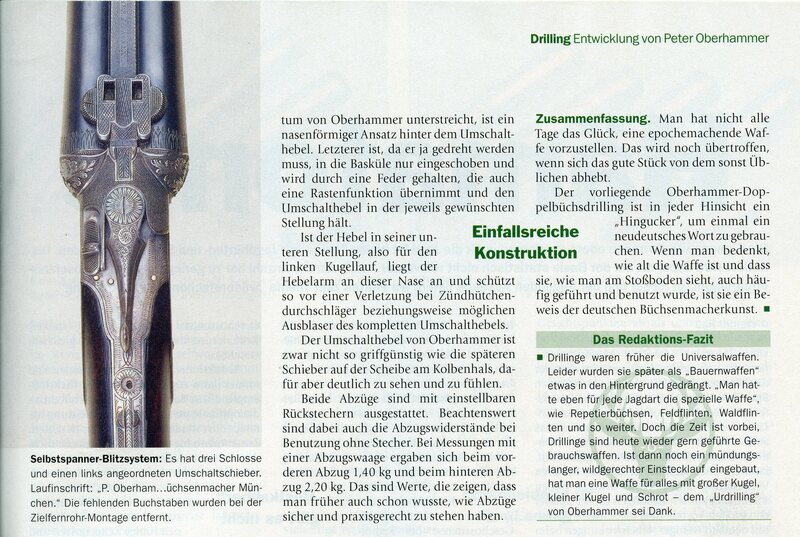 Patent (DRP) no. 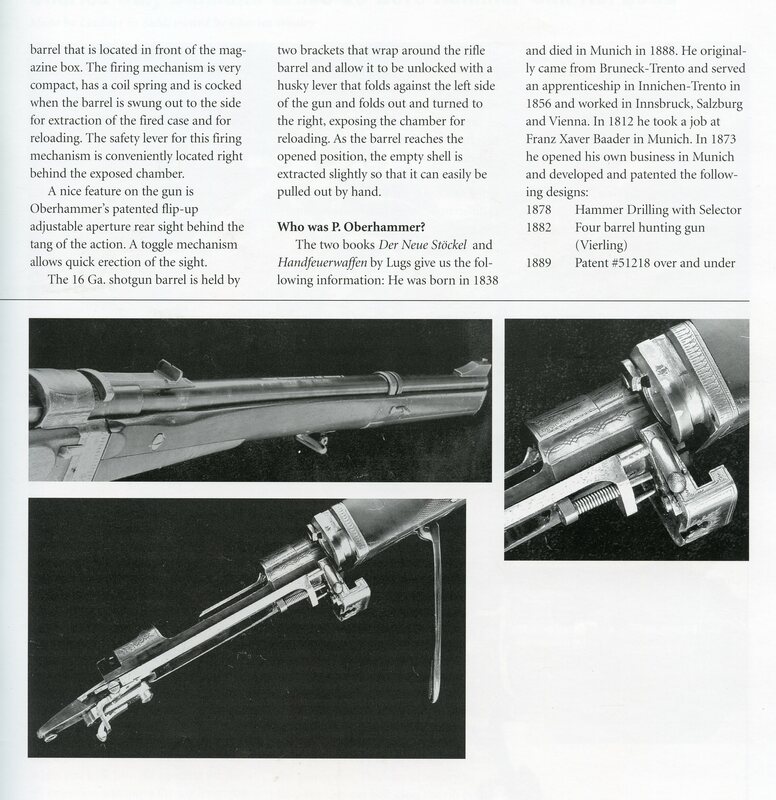 58335 was issued on August 19, 1891 for another break action over-under with the upper barrel incorporating a repeating bolt action. 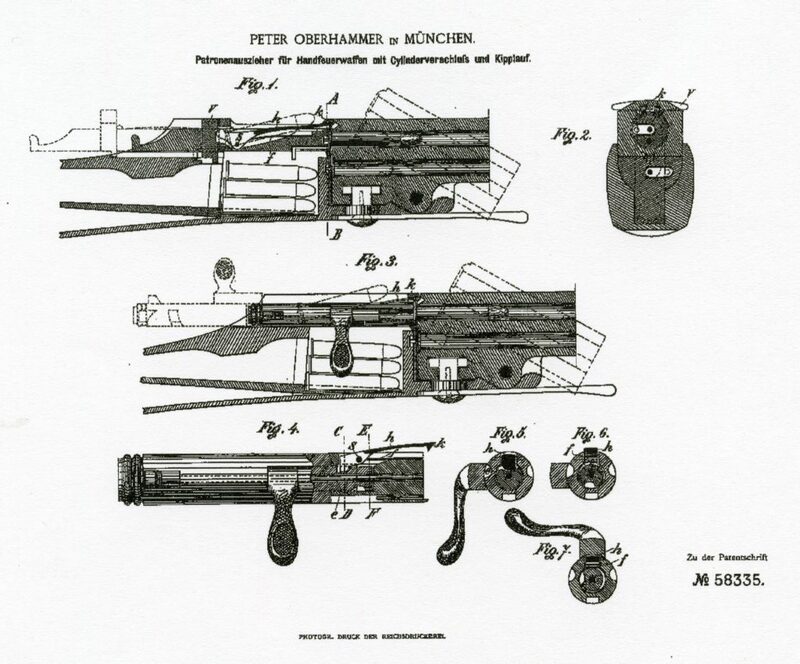 Peter’s last German patent (DRP) was no. 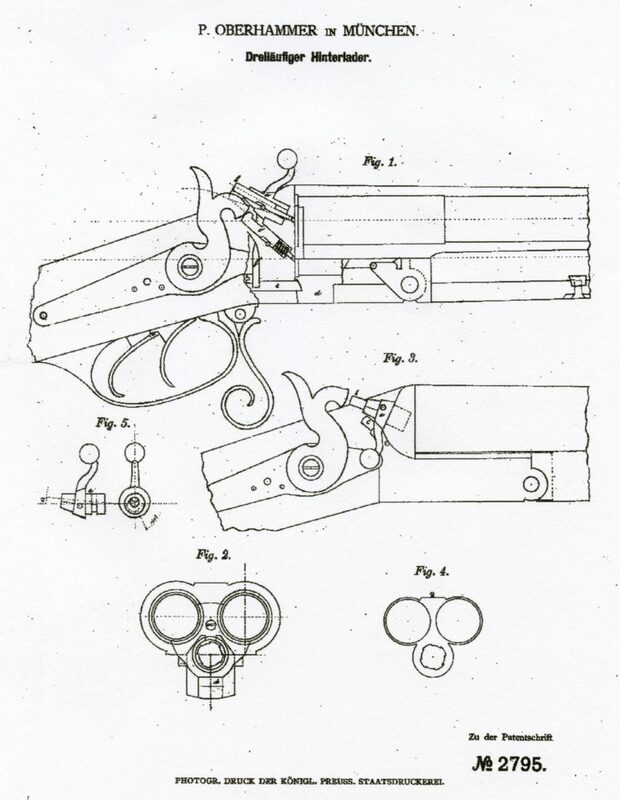 59021 issued on Sept. 25, 1891 for an adjustable folding rear Tang sight. 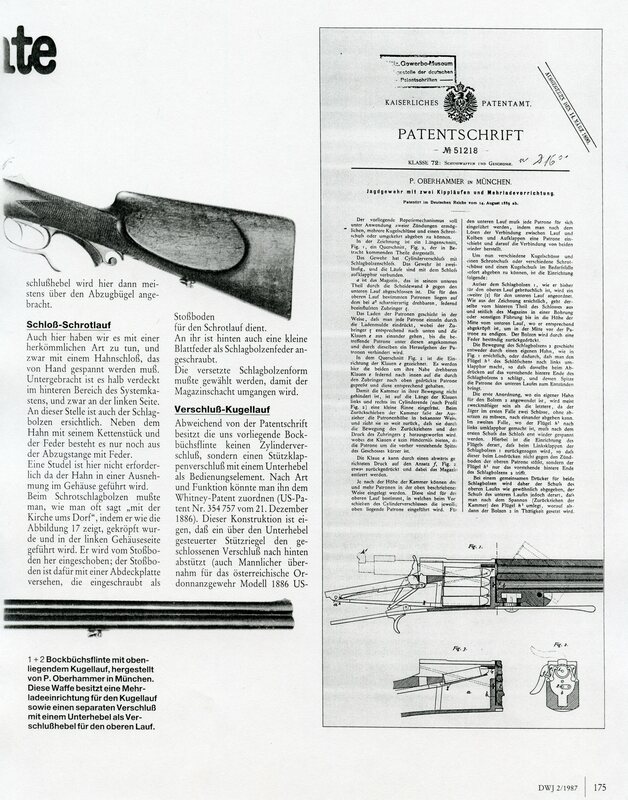 Peter also was granted a U.S. Patent no. 592,437 on Oxct. 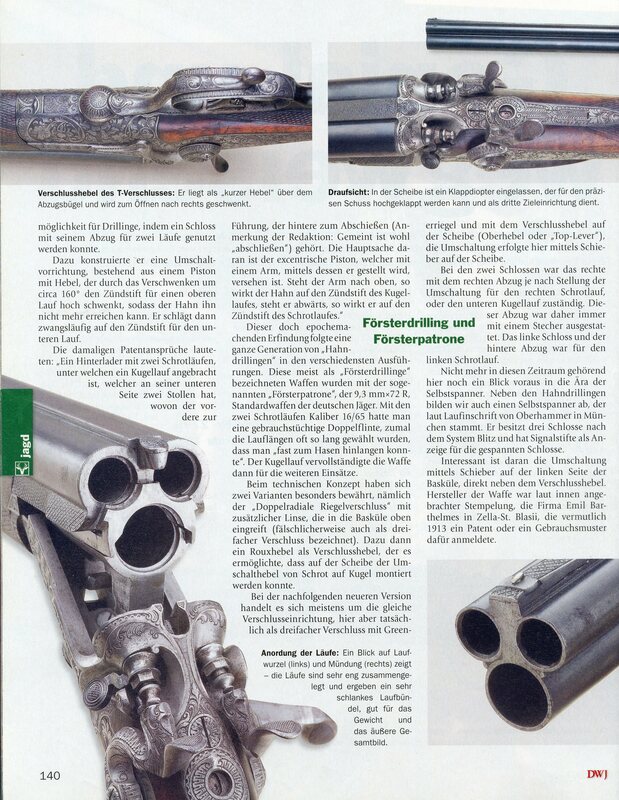 26, 1897 for a rifled barrel with a rifled choke having a faster pitch of rifling in the choke portion. 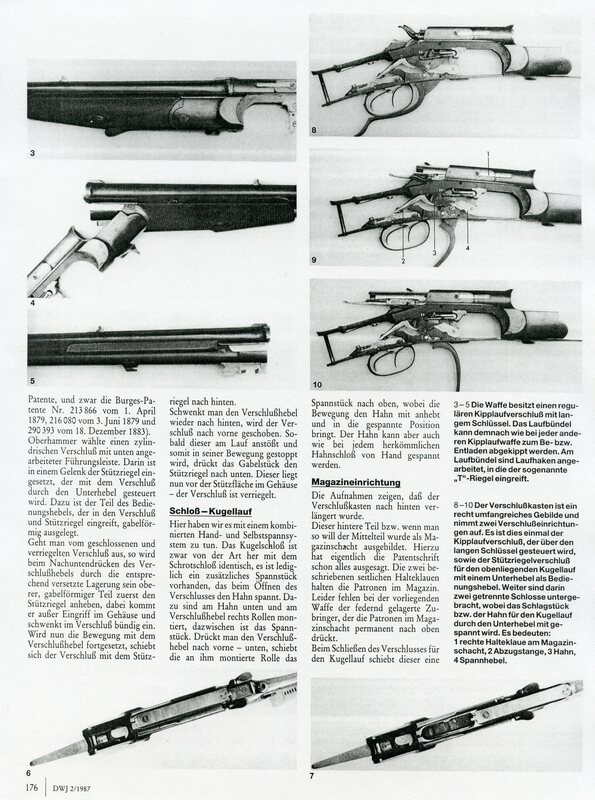 Peter built Bolt Action combination guns on the 98 Mauser Action and these had a lower barrel that pivoted around the upper barrel for loading. On July 13, 1896 he was issued DRGM no. 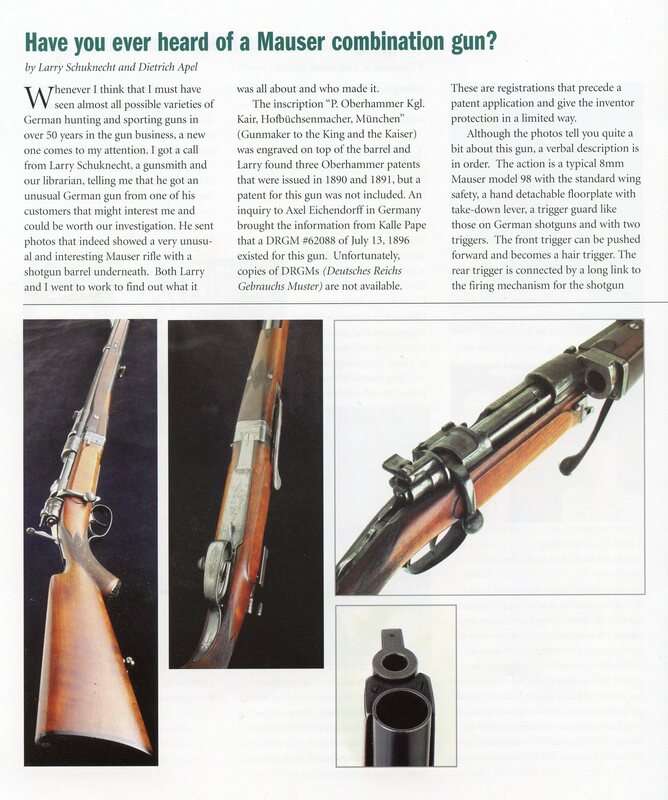 62088 for “A Military Rifle with an additional Shotgun Barrel” and it is presumed that the DRGM covered that action. 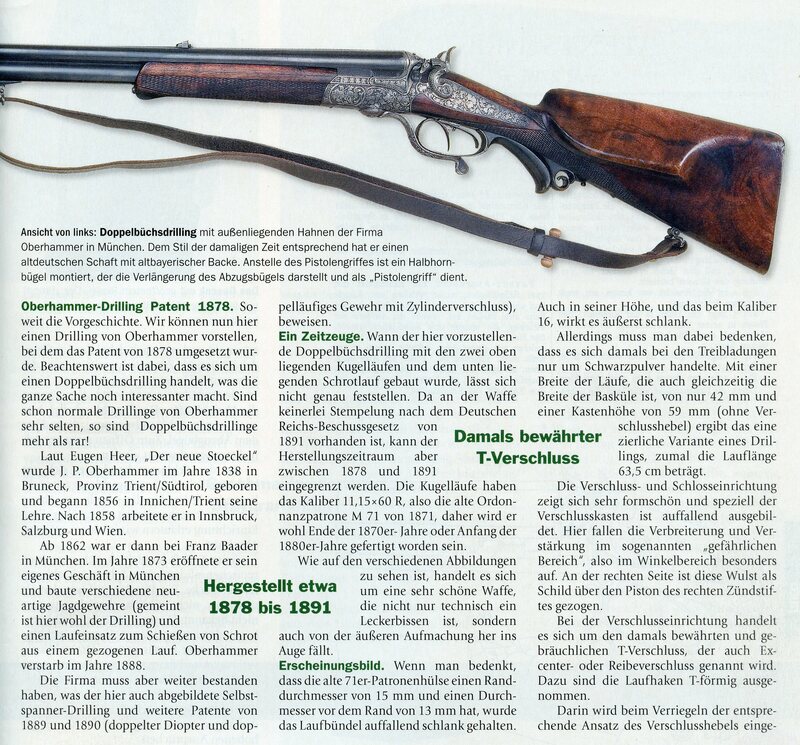 These late Bolt Action guns were probably built by Peter’s son Ludwig who took over the business when his father retired. 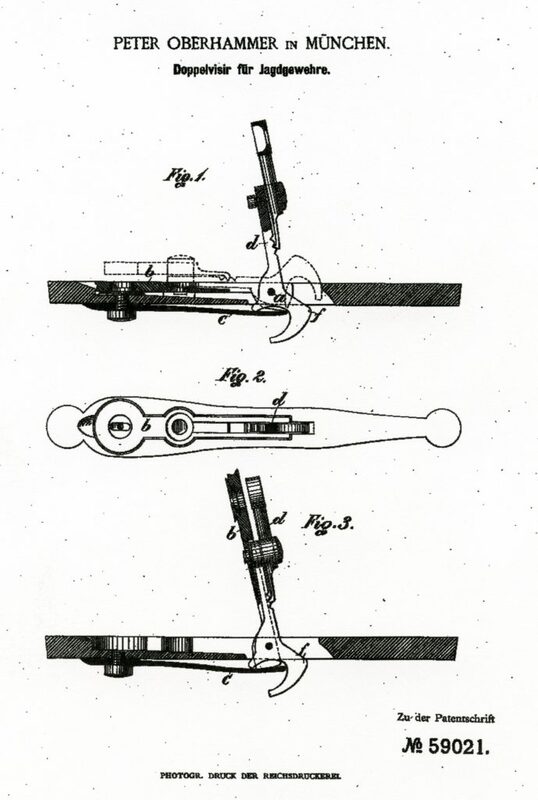 Ludwig was issued a U.S. Patent no. 1664788 on April 3, 1928 for an Automatic Weapon. Ludwig passed away in 1963. 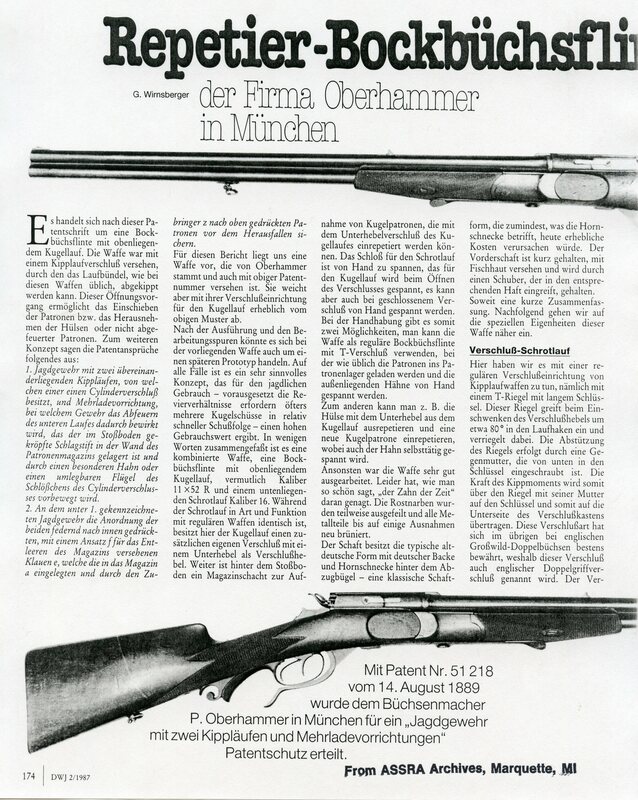 The shop of P. Oberhammer is still in business in Munich at Spiegelstr. 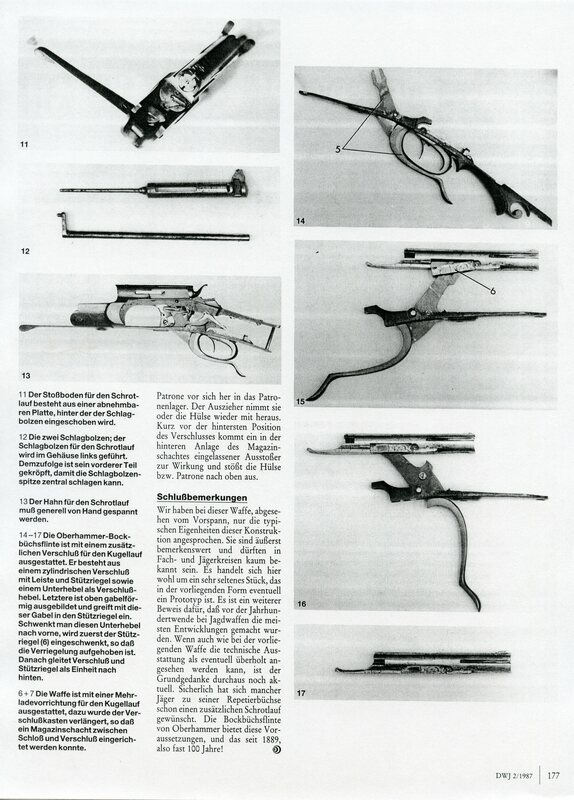 1, 81241 Munich-Pasing as a small Gun/Fishing Tackle shop. 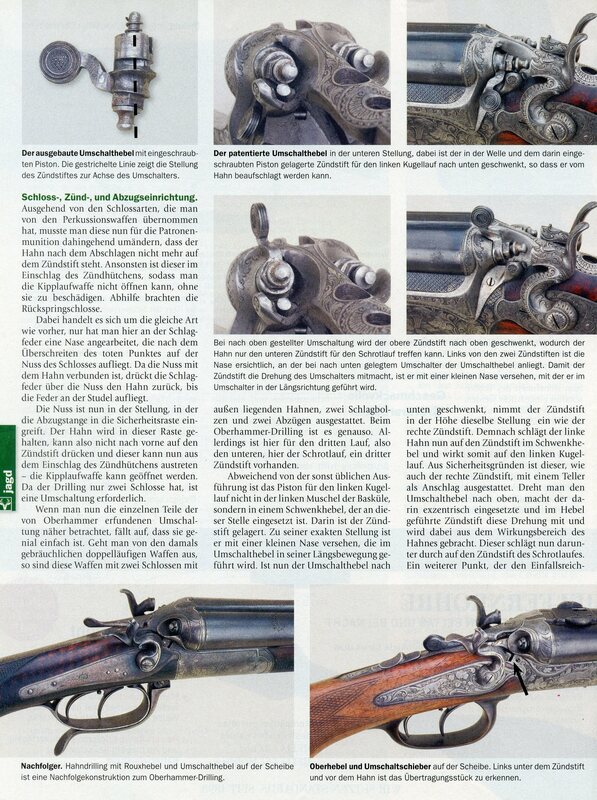 Since the following article was published we have learned that the gun was made by Peter’s son Ludwig.